The goal is to persist data to a file. You might do this for any number of reasons, including storing away user-preferences or, in this case, storing away data to protect you from a crash. 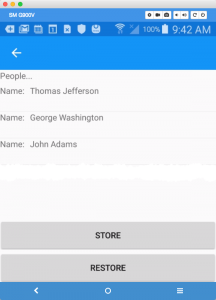 In this simple application we collect names and display them in a list. If the program crashes after the names are stored to disk, clicking restore will bring them back. To do this we’re going to create a generic file repository. This is overkill for this simple demo example, but can be a very powerful pattern to use with larger applications. Because Android and iOS handle files differently, we’ll start by creating an interface, and we’ll use the Dependency Service to invoke the correct implementation at run time. We now turn to the Android implementation of this interface, which we put into a file named File.cs in the Android project. That is pretty much boiler-plate code that you can use every time you create a file repo. We are now ready to create the GenericFileRepository which we can use to store any class implementing IEntity. The job of the GenericFileRepository is to provide CRUD operations. We begin by declaring the Repository to hold IEntity objects and the constructor takes the name of the file we’ll be storing to. Notice that in the case of a saving a single entity we optimize by locating the entity in the collection and if it is there removing just that one and then adding the new one; This amounts to an update. In the case of the entire collection, we blow away the old collection and replace it with the new. It is PersonRepository that sets the file name for storage. That’s it, we’re ready to rock and roll. All we need now is to create a program that uses this repository. As this is a blog post, and not a complete project, I’ll create a very simple demo that requests names, and then displays them in a list. The key feature, however, is that we’ll store those names to the file, and then restore them in the event of a crash. The storage and retrieval code is trivial because we are using the repository. What’s more, this code knows nothing of how the repo implements Save and Get. It may be that the data is saved to a file, or to a database, or to the cloud. There is a very nice separation of concerns. 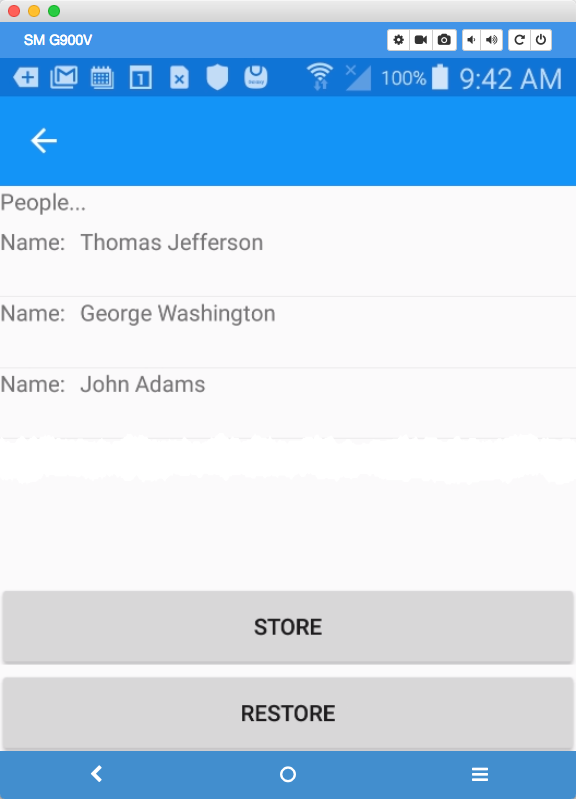 This entry was posted in Essentials, Patterns & Skills, Programming, Xamarin. Bookmark the permalink.